Super Socializer lets you integrate Social Login, Social Share and Social Comments at your WordPress website. You can install this plugin and enable Social Sharing at your website as mentioned here. 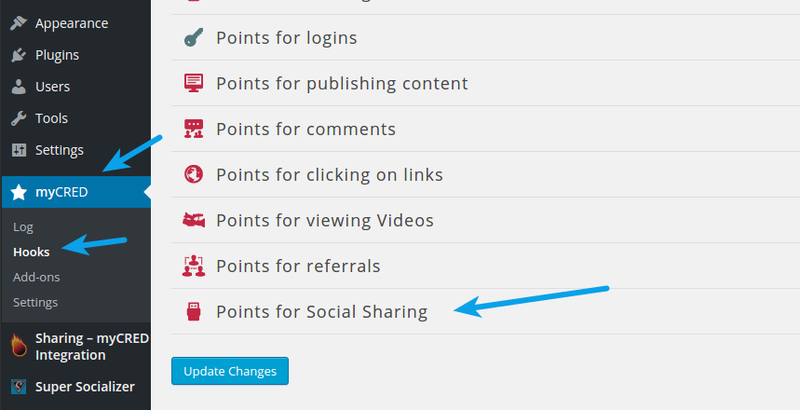 Social Share myCRED add-on provides options to award points to users for sharing/liking your website content over social networks. You can download this add-on here. To install it, navigate to Plugins > Add New page in admin area, click Upload, click Choose file, upload the add-on zip file, click Install Now button and after installation is complete, click Activate Plugin. Pretty easy to set up, isn’t it? You can share your experience by commenting below.